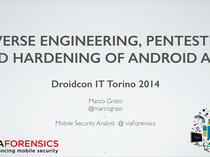 Why do we analyze/manipulate builded Android application? 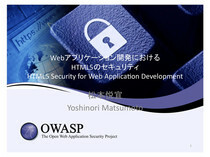 • セキュリティ調査のため / For security research. • 使い勝手向上のため / For improvement of usability. Why do we need to do such a so many steps? zipped into a single .apk file on the device. • Troublesome. so many steps, so many tools. • baksmali(convert smali format to dex file) often fails. • Original signature would be changed by re-sign. 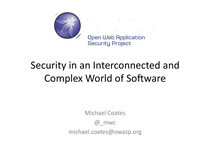 • This security model can restrict access(combination) between applications. • New approach, I’ve never seen on web at least. • root must be needed!! 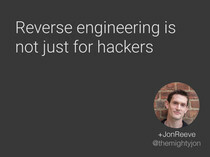 But it doesn’t matter for hackers, don’t it? • The technic it to manipulate cached binary(.odex) on Android directly. • 今回のターゲットは後者 / In this presentation, The target is latter place. It might be not documented. • tool - dexdump only. • dexdump is included in Android SDK. • it’s like a objdump. • Avoid popup and exit by manipulation. • The signature is not changed. • For a dynamic analysis of application, Log output would be effective. • Logging functionality would be exist in a lot of released application. • できるか？ Can we do this? • Many applications have URL strings which would be used for Web API. corrupted, It would be error. • I made an application for manipulation, “Strings poisoner”. • No need pc poisoning. • still under attack if malicious application would be uninstalled. • Pre-install application can not be fixed because it’s not uninstallable. – 今までより簡単な手法 / easier technic. analysis(white hacker) or attack(black hacker). – 大きな改ざんは向かない / not suitable for big manipulation.